Zytech Solar, the Spanish manufacturer of photovoltaic modules, will present its photovoltaic products and systems at the Intersolar 2011 International Fair, which will be held at the New Munich Trade Fair Centre from 8 to 10 June. Zytech Solar will take the opportunity to present a new high efficiency 125 mm x 125 mm, 72 cell monocrystalline module on its stand (Hall A4, stand 139), initially it will have three versions: the ZT200S High Efficiency Black (in elegant black, very suitable for integration on roofs), and the ZT210S/ZT215S High Efficiency, which have efficiencies of 16.84% and 16.45% for the 215 Wp and 210 Wp versions respectively. The three versions weigh 16 kg and have dimensions of 1580 mm x 808 mm x 40 mm. Zytech Solar will present an attractive photovoltaic catalogue on a corporate stand that was specially designed for the event. Various solar products will be displayed in this space, they will include the new high efficiency module, the standard high quality and reliability Zytech modules, and a new glass-glass module for building integration with differently coloured cells. The stand, a new design, will display the latest monocrystalline and polycrystalline silicon photovoltaic technology, and some of the installations built using Zytech modules will be displayed from Spain, France, Germany, Belgium and Holland. More than 600 visitors are expected to visit the Zytech stands, who will be attended by the specialist Zytech commercial team over the three days of the event. 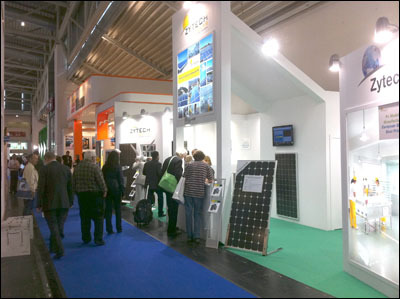 This is the fifth occasion that Zytech Solar has participated as an exhibitor at Intersolar, the most important fair in Germany and probably in the whole of Europe. This event is creating an increasing amount of interest and anticipation among the public and businesses. In fact, more than 75000 visitors are expected, and there will be 2200 exhibitors, 15 pavilions and 165,000 m2 of exhibition space.